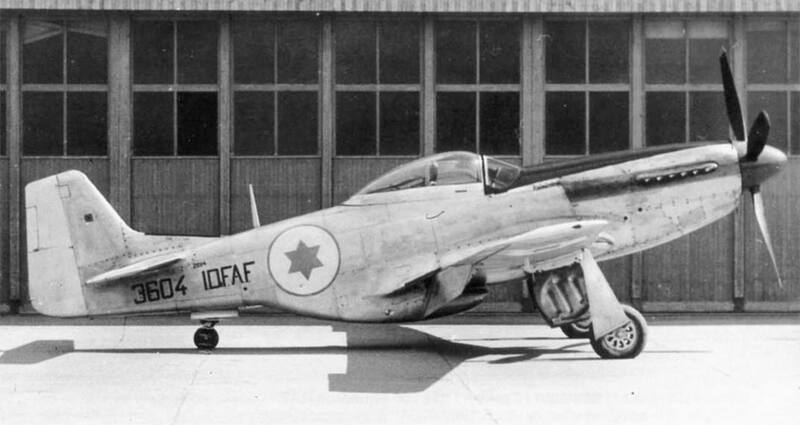 One user of the Mustang in various conflicts was Israel, which used the Mustangs to good effect during various campaigns in the 1940's and 1950's. Find here soon the interesting story of their use with the IDFAF. 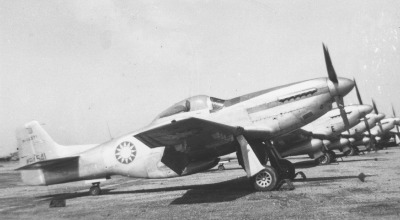 P-51D-20-NA #146 of the IDFAF. 2319/19 was shot down by AA fire; the pilot Capt. Aldad Paz landed behind enemy lines and returned on foot back to Israeli lines after 32 hours, October 1956. 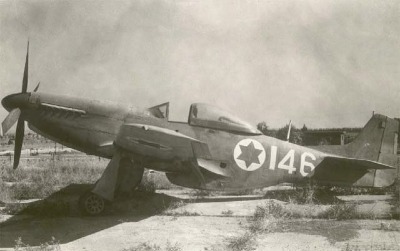 2367/67 crashlanded after an engine malfunction; the pilot Sub-Lt. Chaim Niv was not hurt but the aircraft was written-off August 1956. 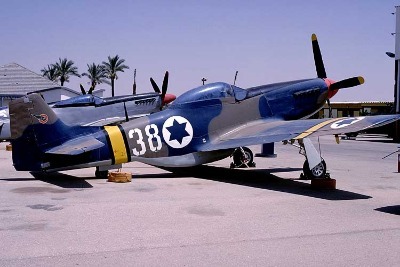 Two preserved IDFAF Mustangs at the Museum / Hatzerim Air Base. 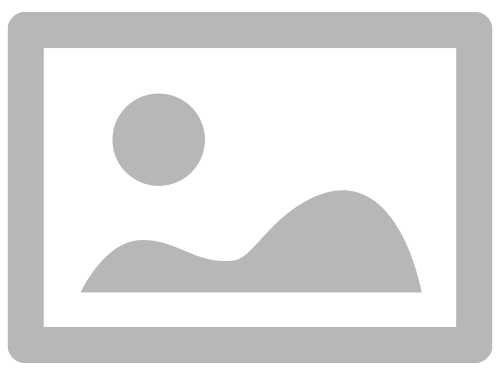 The nearest aircraft is in the colours of No. 116 Squadron (note squadron crest on tail), the rear aircraft is in the colours of No. 101 Squadron. 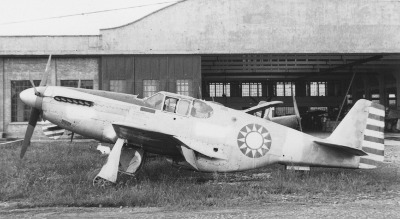 At the end of World War 2, many hundred airplanes, among them dozens of Mustangs stationed in the CBI theatre (CBI = China - Burma - India) were transferred to the Nationalist Chinese Air Force (CNAC - Chinese Nationalist Air Corps). After a short period of time, the number of serviceable aicraft started to decrease due to lack of spares and technical know-how of the maintenace crews. 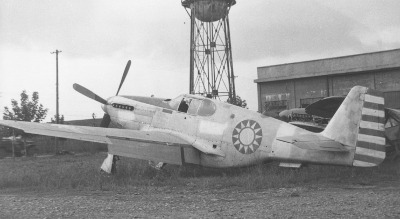 The Nationalist Chinese Air Force also lost a number of Mustangs through capture by the Red (Communist) Chinese forces, during hostilities. 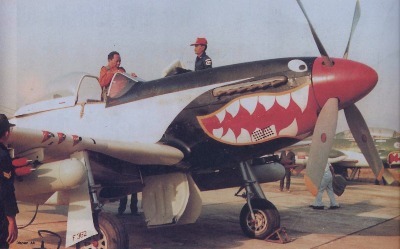 Some of these Mustangs subsequently were put into service under the Red Star, i.e. Red Chinese Air Force or better known as PLAAF = People's Liberation Army Air Force. 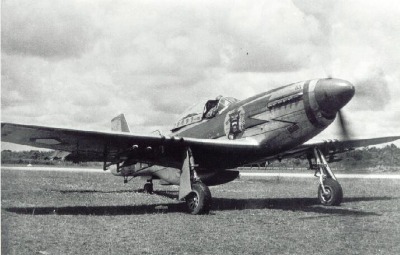 P-51C in the colours of the CNAC - it is a former 23rd FG aircraft and was among the first aircraft transferred. 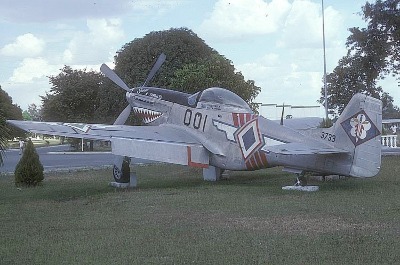 Another view of the same P-51C in CNAC colours. A good side view of this P-51C in CNAC colours - at the same time, a number of P-38's, P-40's and P-47's, plus some other types were transferred. 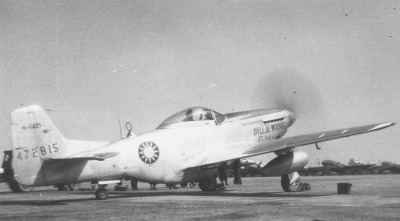 P-51D-25-NA 44-72815 with CNAC code P-14251 shortly after transfer - the nickname "Dilla Wang Hi Hi" is visible on the cowlings, most probably applied before transfer from USAAF stocks; some Curtiss C-46's can be seen in the background. CNAC P-51D-25-NA 44-73944 with code P-14303. 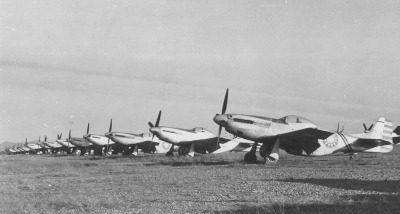 Line-up of P-51D's shortly after transfer from USAAF stocks; nearest aircraft is P-51D-25-NT 44-84541 coded P-14371. Another view of 44-84541 / P-14371. 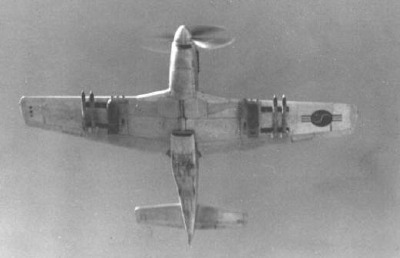 A CNAC P-51D with tactical code 2902. 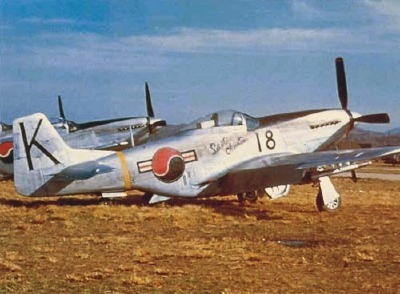 A field full of P-51D's of the CNAC; nearest aircraft carries the tactical code 2612. 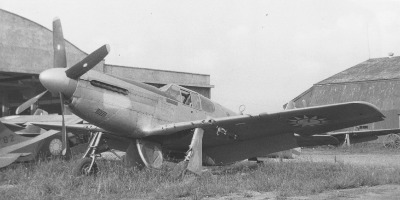 A CNAC P-51D, tactical number 1712. 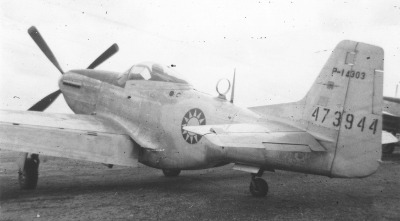 The same aircraft as above, CNAC P-51D #1712 seen here shortly after take-off. 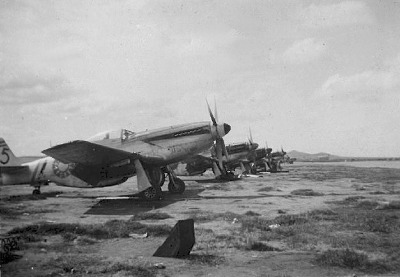 A line-up of CNAC P-51D's shortly after take-over from the USAAF. These aircraft were transferred at a later date, and interestingly, the earlier codes P-14xxx were changed to or replaced by F-51xxx codes. 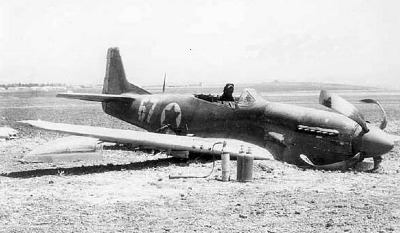 Nearest aircraft is a F-51D-30-NA. 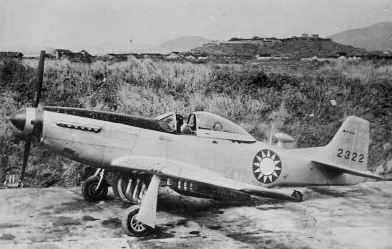 This photo shows a CNAC P-51D Mustang piloted by D. T. Soong at Chusan Island base before taking off to strafe Shanghai. tactical code of this aircraft is 2322. 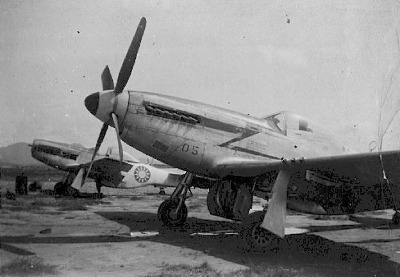 General lack of spare parts and proper technical facilities soon led to the rapid deterioriation of the CNAC P-51 fleet - many aircraft had to be cannibalized for spare-parts in order to keep other aircraft in flying condition. Seen above and below are aircraft in various states of neglect. 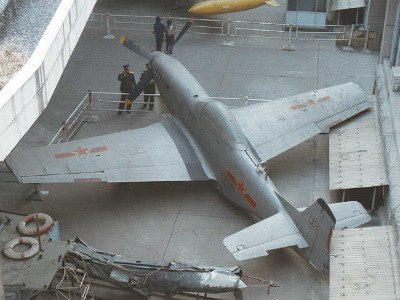 While "05" looks virtually complete, the other aircraft in line lack many components already. 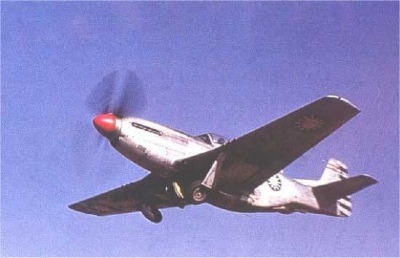 During the hostilities between Chinese Nationalist and Red Chinese forces, many P-51 Mustangs were captured and later used to some extent by the PLAAF (People's Liberation Army Air Force). 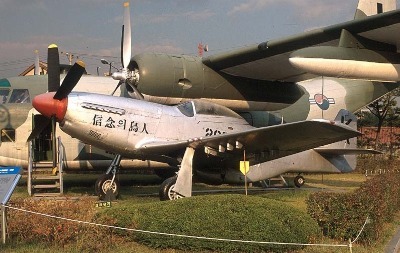 This is a preserved example of a PLAAF Mustang, displayed in Bejing. 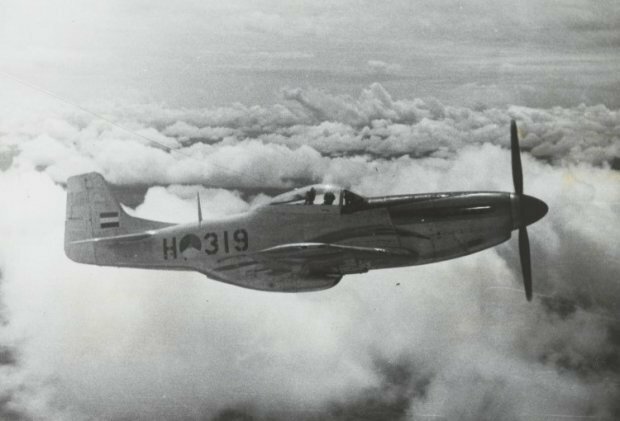 NEIAF P-51D-20-NT H-319 (ex 44-13045) in flight over Indonesia (then Netherlands East Indies) ca. 1946. 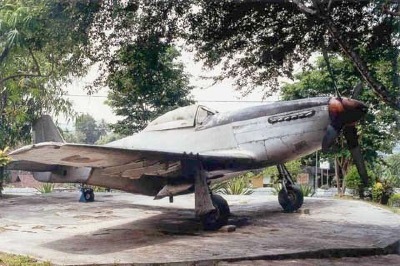 This aircraft was handed over to the AURI (Indonesian Air Force) and later received camouflage paint and was still active in 1958. 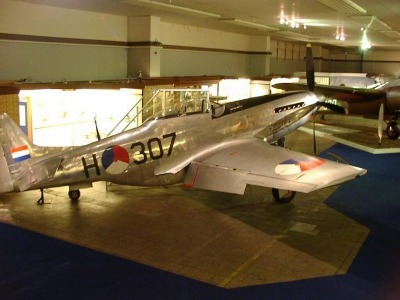 P-51K-10-NT 44-12125 preserved in the colours of the Netherlands East Indies Air Force (NEIAF) on display at Soesterberg (NL). This aircraft, however, was never operated by the NEIAF, but was an instructional airframe at the Technical School at Delft, before it was donated to the Museum. F-305 of the Indonesian Air Force (AURI => Angkatan Udara Republik Indonesia / later TNI-AU => Tentara Nasional Indonesia - Angkatan Udara) with an unusual colour scheme, most probably of the Indonesian display team. 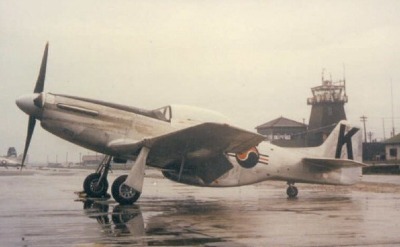 This is a former NEIAF aircraft, P-51K-15-NT 44-12754. Of special interest is the fact that the rocket-launchers attached to this aircraft are of Swiss design, but not identical to those used on the Swiss AF Mustangs ! (via Benno Goethals). 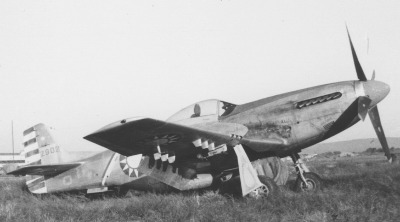 Late delivery F-51 Cavalier II, coded F-362 while still in service. 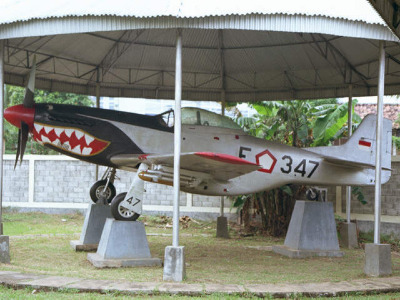 AURI F-347 currently on display in Indonesia (Marc Koelich). 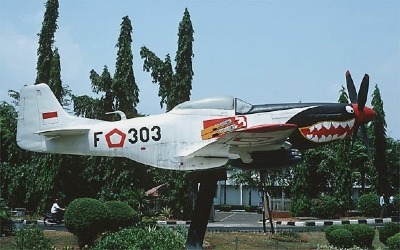 AURI F-363 displayed at Malang. 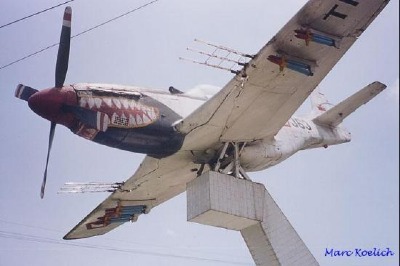 This is a Cavalier F-51 Mustang II rebuilt example now mounted on a pole and slowly deterioriating. Truly a sad end for a once proud aircraft ! (Marc Koelich). Also check walkaround pages for "F-338" and "F-347"
Another preserved example, F-354 in fake NEIAF markings on display in a Railway (!) Museum at Palagan. This photograph taken during Fall 2004 shows the same aircraft after getting some much needed attention: It received a roof and a new layer of paint (photo: Sigit Sumaryanto via Marc Koelich). 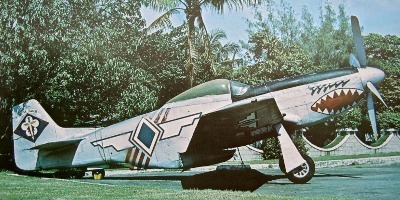 Another preserved TNI-AU F-51 - The serial "F-303" is not the original one and the aircraft appears to have seen several modifications, most probably by using components supplied by Cavalier, Sarasota, FL. 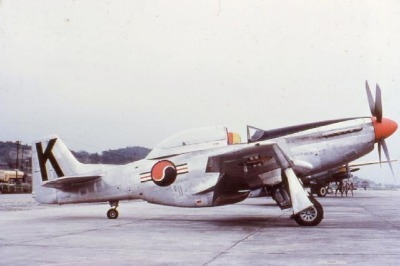 The ROKAF (Republic of Korea Air Force) started to receive Mustangs from the USAF during the Korean War and used them mainly in the ground-attack rôle. 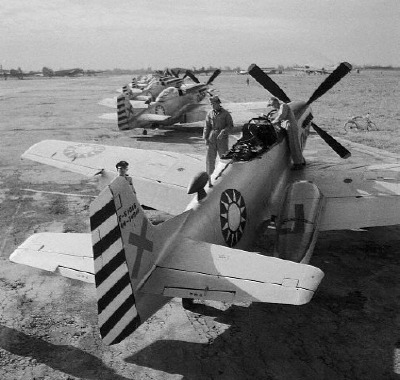 After the end of the conflict, the Mustangs soldiered on for a few years until being replaced by jets and eventually scrapped ca. 1957. 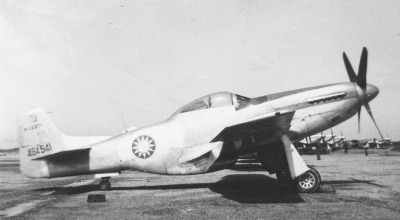 Ship #13, one of the first Mustangs transferred to the ROKAF in 1950. The US insignas were hastily overpainted. 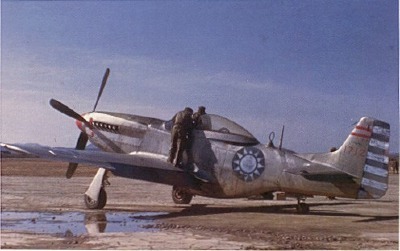 The most famous Korean Mustang, ship #18, flown by Col. Dean Hess. Formerly USAF serial 44-74692, it was assigned to the "Bout One" project on 8th October 1950 - the writing below the canopy reads "Last Chance" - "By Faith I Fly" was written on the port side. Before being transferred to the Korean War Zone, this a/c had served with the 182nd FIS, TX ANG. 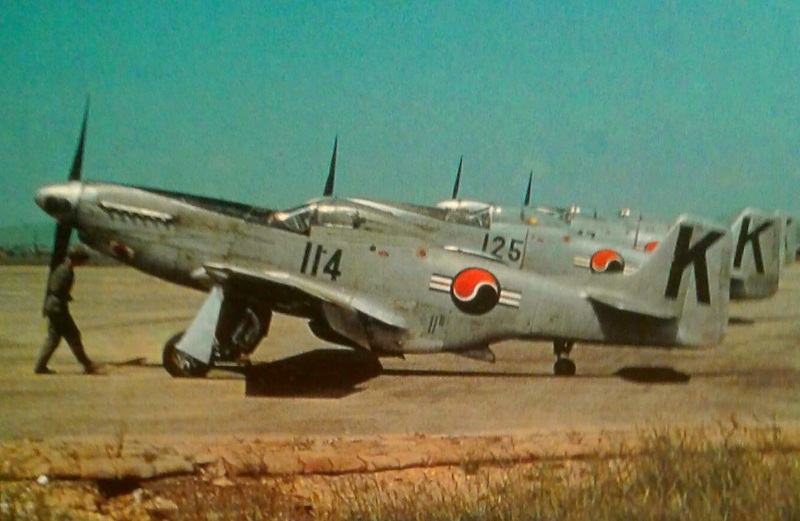 Line up of ROKAF F-51's - it appears that these aircraft are from the first batch delivered in 1950 (Doug Kessler). 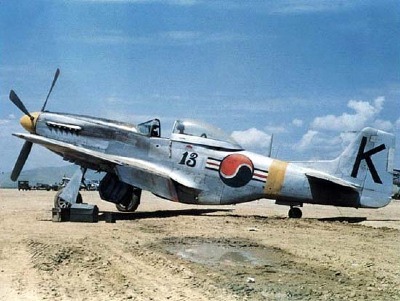 A ROKAF F-51 Mustang shortly after take-off to another mission in support of the ground-troops. Standard load for such missions was rockets and bombs as seen here. 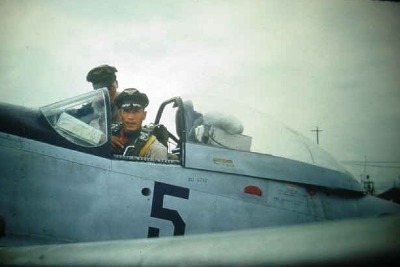 The same aicraft as seen above, ROKAF #5, with a Korean pilot in the cockpit. A nice taxying shot of aircraft # K-75, taken ca. 1953. While during the hostilities, aircraft carried a number only, the letter "K" was later added to the number on the fuselage (GD Howell). 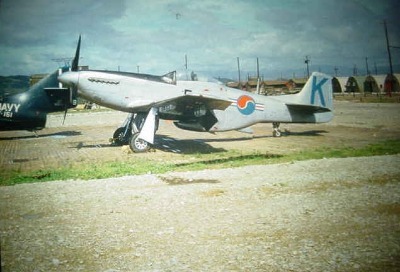 Later deliveries to the ROKAF also contained some rare TF-51D-25-NT's, the dual-control version of the standard F-51D, this example here being former 44-84669. Another great view of a ROKAF TF-51D. Another TF-51D preserved in Korea today. The aircraft behind is a North American T-6G Texan. 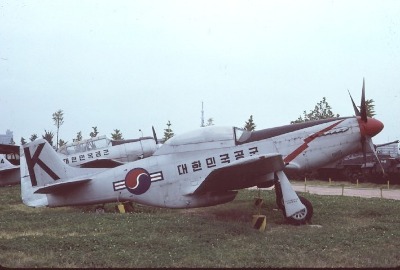 Another preserved example, this time a single-seater, at the Seoul War Memorial is ROKAF-205, formerly USAF F-51D-25-NA 44-73494. The camouflaged transport aircraft behind is a Fairchild C-123 Provider. 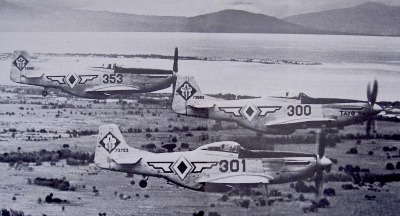 The Philippine Air Force was another user of a substantial number of F-51D Mustangs directly from USAF stocks. During the 1950's, this country operated over 150 Mustangs. 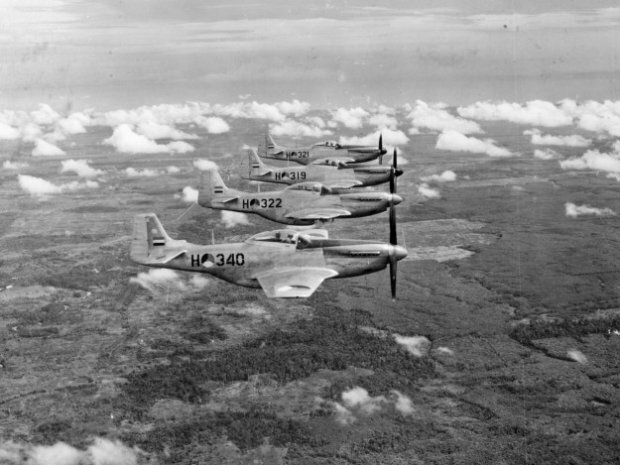 A trio of F-51D-25-NA's of the 7th FS, PhAF (Philippine Air Force) on patrol - visible in this photo are #300, serial 44-73664 nicknamed "Tayo Na", #301, serial 44-73733 and #353, serial 44-72999. Line-up of Philippine AF F-51's - nearest aircraft is 45-11369 #406 (John L. Dienst collection). 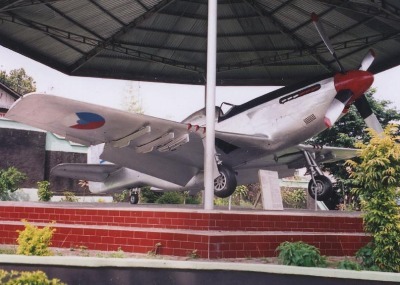 One of the few survivors, on display in the Philippines. Another survivor, # 3733 coded '001' and nicknamed "Shark of Zambales". It is belived that this is former 44-73733 as seen in the b/w photo above, carrying code '301'.